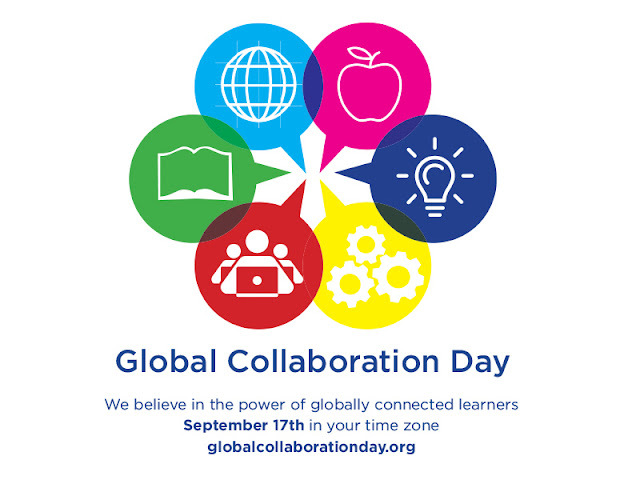 The Global Educator: Global Collaboration Day - September 17! Next week, on September 17, it is Global Collaboration Day. Organised by Lucy Gray and Steve Hargadon from the Global Education Conference, along with advisors, this one day (nearly 48 hours - it is September 17 somewhere in the world for this long!) event brings together organisations, educators and creative ideas. during ‘Global Collaboration Day, September 17, 2015. We are looking for as many educators as possible at all levels to participate, contribute and collaborate around the theme of ‘online global collaboration’ over the 24+ hours of the collaboration (see time conversion chart). We are excited to include K-12 and post-secondary levels of education and welcome contributions from across the world - and we really do hope this will be the World's LARGEST Global Education Collaboration!! Please plan to contribute! Please spread the word!